I can’t fit the library in one picture now! 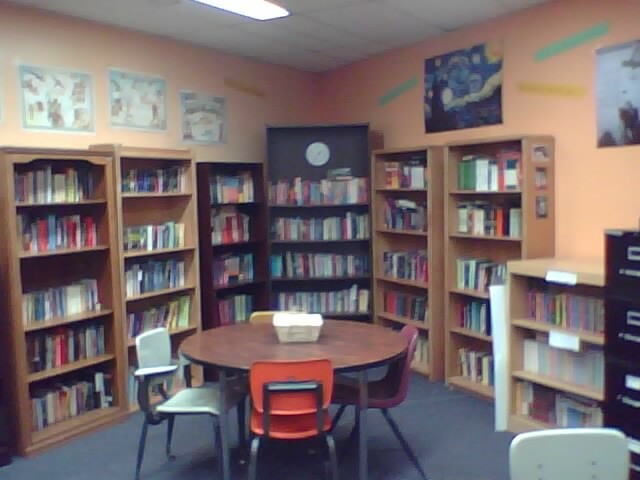 The next picture is of the other part of the library. 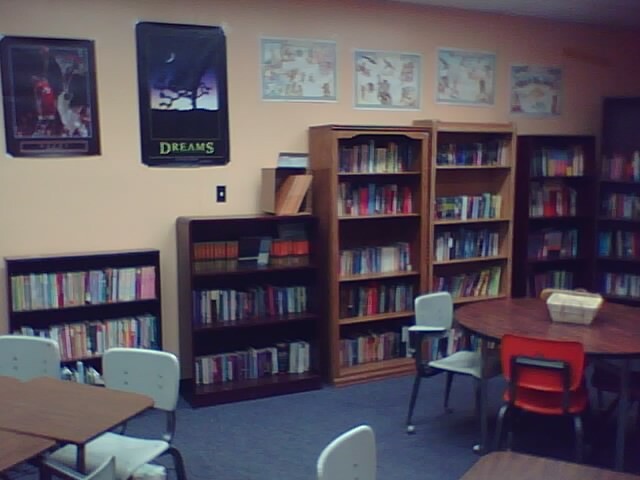 The sentence strips read “Words are the voice of the heart,” “Read with mind, write with soul,” and “Reading is a window to the world.” You can just barely see in this picture where one of my students labeled the shelves based on what’s on them (they’re organized by genre). 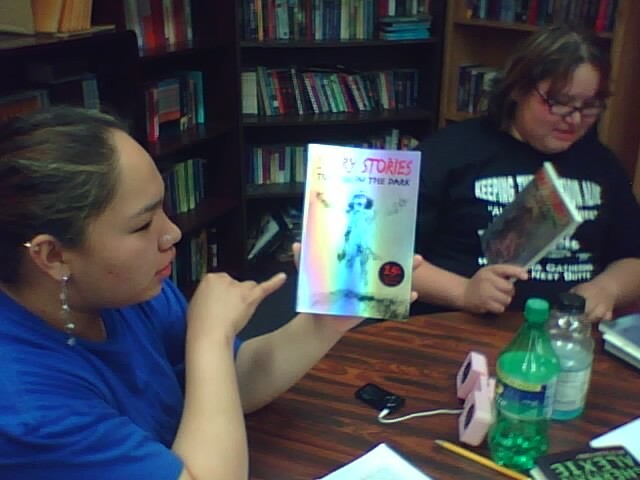 –Taneesha (the girl to the right back of the picture–she was REALLY excited about the Scary Stories books). I sure enjoyed watching the library grow. 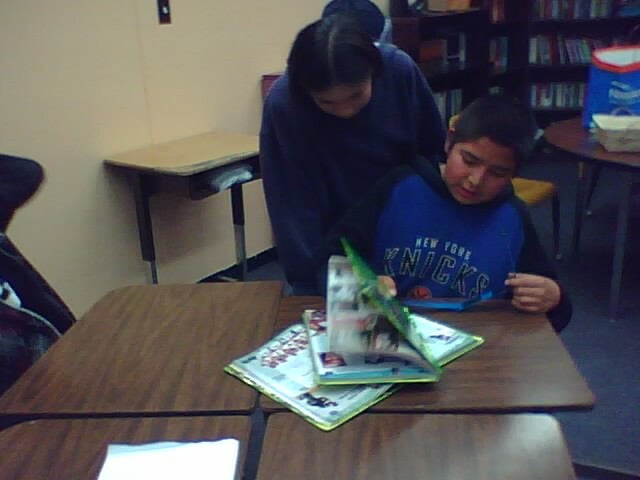 Thanks to Wick and to Noah for including us all, and happy reading to the Pine Ridge Reservation! Congrats on law school, Noah, and keep us posted. Noah, how about an address at the school or somewhere else on the reservation — for over the summer in case people come up with more books to send? Two thousand books was beyond anything I thought we could pull off at all, let alone is a few months. Though the results from one effort are insufficient to predict much, the success does encourage me on something I’ve often wondered about. What currency for providing a great education does Williams, or any institution, have beyond a thick envelope and admission to an incoming class? More than we think? I don’t mean to propose actions to dilute the quality of one of those seats. Assuming for a moment that even Ephblog is a part of Williams, look at what just happened for all these students on the Pine Ridge Reservation. I can’t see that this effort diverted any capital, cash or sweat, from Williams. I think this effort is evidence of something beyond just a good deed. What? I’m not sure. This is the best achievement of a two-year-out grad that I can think of. Way to see what was needed and go for it, Noah. Re: #4 – I hope that this is just the beginning for Noah. EphBlog is powered by WordPress and delivered to you in 1.193 seconds using 39 queries..